UPDATE: The 2015 edition of my marketing technology landscape is now available, charting 1,876 different companies and open source projects. The short version: the above graphic is the latest incarnation of my marketing technology landscape supergraphic (click for a high-resolution 2600×1950 version, 4.7MB). It represents a whopping 947 different companies that provide software for marketers, organized into 43 categories across 6 major classes. A high-resolution PDF version is also available (14.3MB). Please feel free to copy, repost, distribute, and use this graphic “as is” in any context you’d like. It comes with one main caveat: this graphic is not comprehensive. It is just a sample, albeit a large one, of the many different kinds of software available to marketers today. There are many more companies — indeed, entire categories — that were not included, merely due to the constraints of time and space. And by the time you read this, it will inevitably be out of date due to new launches, re-launches, expansions, exits, and mergers. The pace of change in this field is breathtaking. That’s the short version. For further elaboration, read on. It’s been 16 months since the last version because, frankly, I wasn’t planning to do another. Terry Kawaja of LUMA Partners had added a terrific marketing technology LUMAscape — his original display advertising LUMAscape was my inspiration for my first landscape. The folks at Gartner had released their brilliant digital marketing transit map. I was content to retire from the rearranging-little-logos business and leave it safely in their hands. But two things brought me out of retirement. First, the number of people who kept using earlier versions of my graphic and expressing their appreciation for it — while also nudging me to, um, kindly update it — meant a lot to me. Second, I had a breakthrough in how to organize the landscape that got me really excited. One of the things that I was less than happy about with the previous version was its lack of underlying structure. One commenter wrote, “seems to be a bit of an icon ghetto without a ton of insight.” Harsh, but true. I was expressing the magnitude of the marketing technology space, but I wasn’t bringing much order to the chaos. A new version in that same format with even more icons would just exacerbate the mayhem. The breakthrough occurred in discussions around my post in October on the emerging third-party era of marketing automation. Marketing automation, CRM, WCM, and e-commerce engines were increasingly serving as true platforms, with ecosystems of interoperable marketing applications growing around them. An exchange in the comments with David Raab also led me to his insightful thinking about customer data platforms (CDPs). It struck me that these CDPs, along with some other technologies such as tag management and cloud connector services such as Zapier, were coalescing as marketing middleware — software to help all the other software in marketing work better together. But before we explore these classes further, let’s talk about categorization for a moment. Why did/didn’t you include us in Category X? Why don’t you have a Category Y (since that’s what we really do)? To start, let’s agree that any attempt at categorizing a field this large will be imperfect. For one thing, there are opposing forces that cause vendors to want to embrace specialized new labels — to own their own category — yet also be recognized in broad existing categories (since that’s where there’s usually a large, identified market). It’s a tension that every product manager in this space wrestles with. The situation is further complicated by the fact that categories can always be divided into subcategories, the labels and definition of categories vary depending on who you ask, many products cross multiple categories, and vendors are constantly acquiring and pivoting their way into different categories. It’s a bit of a hot mess, and there’s a near infinite number of ways you could divvy it up. Out of those infinite possibilities, this is merely one: my humble opinion, at this moment in time, about which categories might be most useful to a marketer surveying this landscape. For the most part, I avoided duplicating companies across categories, with very few exceptions. So if a vendor’s products spanned multiple categories — which many of them do — I usually just picked one, whichever one I thought was best. The main exceptions are the giants who have acquired across the whole space, such as Adobe, IBM, and Oracle. However, while categories are useful to illustrate clusters of related marketing technologies, many innovative products out there are being designed outside the boundaries of these categories. For the record, I think that’s awesome. Our industry is young, and there’s so much potential for innovation. Inventing the future shouldn’t be constrained by the labels of the past. All that is to say: take my categorization choices with a grain of salt. 1. Marketing Backbone Platforms and Marketing Middleware. These two classes of products are bringing some much needed structure to the marketing technology stack. Platforms are software that every marketer needs — a CRM, a core web content/experience system, and at least basic marketing automation (i.e., campaigns and customer journey management). And an e-commerce engine, if that’s part of your business. You may get these pieces from one vendor or several, but they will serve as the foundation for your marketing technology stack. What makes them platforms, rather than just products, is that they’re increasingly open — interoperable with other, more specialized marketing software. Middleware is the “software glue” that makes it even easier for multiple, different products to work together. Instead of each product needing to explicitly integrate with each other product out there — an impossible n2 integration points — middleware can serve as a common highway system for data between them. Data management platforms (DMPs) and customer data platforms (CDPs) are the emerging giants in this role, but tag management, cloud automation/integration products, user management/single sign-on services, and API management are all a part of this important connective tissue. 2. 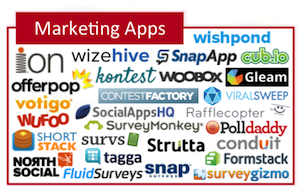 The Emergence of the Marketing Apps Category. I believe there’s a new category of marketing software that’s emerging for marketing apps. These products let marketers produce interactive experiences, rather than static content, to engage their audience. This nascent category contains products that were once considered unrelated to each other — polls and surveys, social contests and sweepstakes, and app-like web and mobile experiences such as wizards, configurators, calculators, etc. But I believe they share a common DNA of letting marketers build interactive experiences to better acquire and nurture customers — without expensive, custom programming. In full disclosure, the company I co-founded, ion interactive, is included here. I’ve been increasingly impressed with the app-like experiences that our customers are building with our product and the results they’ve been able to achieve with them. I’m not going to pitch you here, I promise, but if you want to see examples of these “marketing apps,” check out the Marketing App Idea Book we published last month. 3. Consolidation and Diversification in Marketing Automation. The second largest category of products in this landscape is marketing automation/integrated marketing platforms, with 51 different vendors. Many of these are new ventures or expansions of vendors from other categories (especially email marketing). And there are undoubtedly more that I inadvertently overlooked (my apologies). It’s a big category. My point is that although there has been some notable consolidation in the marketing automation space — Adobe (Neolane), IBM (Unica), Marketo, Oracle (Eloqua and Responsys), Salesforce.com (Pardot and ExactTarget), and Teradata (Aprimo) — there has also been significant diversification. The marketing technology space is still a huge growth market. The perfect storm of cheap cloud computing, open source software, rich web development frameworks, a global talent pool, and the accessibility of customers through content marketing makes it easier than ever for new ventures to enter this space with imaginative new ideas and sheer entrepreneurial gumption. 4. “Ad Tech” in the Minority in the Marketing Technology Landscape. Out of the 947 companies included here, only about 10% are focused on advertising. Granted, this landscape is not comprehensive, and there are many advertising technology companies that are missing from it. But there are also many non-advertising vendors missing too. Even if the ratio is off by a factor of 2X or 3X, there’s still no denying that the vast majority of marketing technology innovation is happening outside the context of advertising. This is indicative of — and directly enabling — the seismic shift of marketing away from advertising to experience-driven marketing. Content marketing, social media marketing, interactive experiences, and the analytical capabilities to optimize those efforts with continuous experimentation are where the largest flood of innovation is occurring. For instance, there are 66 vendors in just the social media marketing category alone (and many more that I couldn’t squeeze in). To be sure, there are many amazing advertising technology vendors out there, and new ones will continue to arise. But the momentum of the burgeoning marketing technology field clearly has a different center of gravity. 5. A Rich Collection of Agile Marketing Tools. Finally, I’m excited by the wonderful set of agile management tools that are available today. Granted, most of these were not designed specifically with marketing in mind. But the ones I selected here can work beautifully in supporting agile marketing. More generally, the growth and innovation with these products speaks to the increasing traction that agile and lean management philosophies are gaining across more and more organizations. Because while all the incredible marketing technologies illustrated in this landscape are dramatically changing what’s technically possible for businesses to achieve, the bottlenecks that still hold teams back are more likely to be the remnants of management approaches from the last century. The continued rise of agile methods and culture, however, is helping to reinvent marketing management for this century — so the human parts of our marketing, which will always be the most important parts, can harness the full potential that all this technology has to offer us. Those are my initial thoughts. As you explore this landscape, I’d love to hear yours. P.S. If I missed including your company in this landscape, I apologize. No slight was intended. Please feel free to tell us about your venture in the comments below. No guarantees, but when I go to do another version of this landscape in the future, I’ll check here first. Scott, I’m so glad you took time to return to the “rearranging-little-logos business” for this graphic. The clear visualization of the six categories provides a meaningful hierarchy to help in educating others about the marketing technology structure, unlike anything I have seen thus far. I’m looking forward to putting it to use this year. The growth of the marketing PaaS and Middleware categories demonstrates the maturation of the entire marketing technology industry as martec programs are formalized into a unified technology stack. Excellent work. Thanks! Thanks, Amy! The solidification of such a vibrant set of platform and middleware vendors in this space is definitely the most exciting revelation I took from this project. Scott as always you are placing brilliant content. A very comprehensive list and also highlight how complex everything is getting. Great for choice but also in some cases overwhelmingly confusing at the stage of doing vendor review. Especially in the marketing automation scene, everyone claims their technology covers everything but in reality or sometimes you simply encounter a glorified email marketing tool with a couple of add ons. The best of it all is that the more providers that exist, it will drive product improvement and costs will inevitably be more affordable for the small/medium companies. Fantastic.. thanks for taking the time to publish it. Thank you, Ricardo. Yes, I agree the space in its totality is overwhelming — and as I disclaimed up front, this graphic is actually far from comprehensive. However, the upside that you point out is that, overall, this will drive innovation up and drive costs down. And it’s worth remembering that all these tools are ultimately just a means to an end. What matters is a great product, a great marketing strategy, and great marketing execution. Your choice of tools doesn’t have to be “perfect” — it just has to be good enough to accomplish your mission. Scott: would you consider Marketing Apps as a category that covers what was formerly known as point solutions? Great improvement over your prior versions Scott. The categories you have developed help add some structure to the crazy marketing software industry. 🙂 I especially like your Marketing Apps category. The need to build interactive experiences with these apps will become more important as content marketing continues to build steam. Thanks again for putting the time into revising this chart! Impressive work! Respectfully, I’d like to make you aware of my company – Aginity, LLC. (www.aginity.com) We are a Premier IBM Business Partner and a true leader in the Marketing Technology Middleware space. Our solution easily organizes all of our customer’s disparate client data to publish to Marketing Execution Systems at 10X the speed of traditional IT integration methods. We are the glue that makes the 900+ other companies in your graphic more effective at what they do! We will be demonstrating inside of IBM’s Booth at next week’s NRF Big Show in NYC and we will also have a separate demonstration booth of our own (#4424). I hope you and your readers will stop by and say hello to learn more about us and the value that we are delivering to some of the largest companies in the world. Cheers! Thanks, Jack — and thanks for chiming in on Aginity. You guys are a terrific example of marketing middleware. Scott – I applaud you for taking the endless hours to demonstrate just how vast the technology marketing enterprise landscape has become in such a short period of time. To your point about the platform categories, this maturation is almost analogous to the general software application space about 15-20 years ago. We actually partner with one of them, and let me tell you, it’s very much required. I bet you are right about the big boys gobbling up the next generation of players. While Black Ink is not a big boy (yet), we are happy to serve CMOs and CFOs alike in understanding their marketing performance from a financial perspective across all data environments, analytic and applications. Way to go! Thanks, Jeff. I think what Black Ink is doing at the intersection between marketing and finance is very exciting. I know the “MRM” category doesn’t fully do that justice — what you’re doing is quite different than most of the other vendors in that cluster. But with the increasing interest in aligning CMOs and CFOs, I suspect that “marketing finance” may soon be a well-known category in its own right. Best wishes! Hi Scott. Big applause, very good overview. This revised edition is much better than the last one (which also was great work). The previous version of this graphic was frequently used to frighten people — “boo! look at the chaotic madness of the marketing technology space!” I hope this new version, while it’s still daunting in its scale, will help illuminate a bit of the emerging order and make it (a little) easier for people to make sense of how these pieces fit together. Scott, thanks for taking the time to put this together and share it with the rest of us. The structure makes a lot of sense and should help every marketer make sure they have a sound understanding of the big picture before they get caught up in tactical decisions about individual products and capabilities. Great stuff! Thanks, David. I found your blog to be the single most valuable resource in shaping my thinking of the architecture for this landscape. I’d gush more, but the rumors of us being alter egos might flare up again. Scott, this is incredibly well done–I cannot imagine the time and energy it took to assemble! Thank you for including HubSpot in the integrated marketing category, we are honored to be a part of the list. For Sales Enablement next year, we’d love for you to consider Signals: http://www.getsignals.com in the offerings as well. In the meantime, Happy New Year–wishing you and the other marketers included on this list a very happy and healthy 2014! Thanks, Katie. It was a little bit of time to assemble this, but everybody needs a hobby, and I don’t golf. Keep up the amazing work at HubSpot — making all us Boston marketing technology types look good. Signals looks like a great product. Scott, awesome job and I am excited that you had this break through about middleware and the need for a centralized customer data platform. I just wrote a blog to help to better define this category (but a lot more work on this is still needed and I welcome all discussion on the topic). See my blog on The Seven Virtues of a Customer Data Platform here: http://www.agilone.com/customer-intelligence-2/the-seven-virtues-of-your-customer-data-platform/. Thanks, Dominique — you raise many great points in your post. I love your graphic of Integration of the B2C Customer Lifecycle. The CDP/DMP category in my landscape has very high variance among the products. (Actually, most of the categories I’ve assembled here have that property.) They’re definitely not all interchangeable, and different ones are solving different problems. One point that you’ve raised that I agree with wholeheartedly is that “marketing middleware” isn’t just technical plumbing. Although it does provide connective tissues between multiple other different marketing technologies, it’s using that connectivity as a means to an end to deliver higher-level business value. Scott, first of all, let me wish you a Happy New Year 2014 and then let me thank you for this great gift. Looking at it, and thinking as a marketing technologist I had a digital dream: What if instead of a picture, you could provide this Excellent and Incredible work in an HTML 5 landing page, with a clickable map, and a crowd sourcing app on top of it letting all people working for companies add new companies, and more valuable select and share the tools they use in each stack and how well the integrate in their marketing usage of them? Without forgetting analytics like the most clicked logos, etc. It’s a great idea. I’ve contemplated a dynamic version of this, driven by software — it’s kind of ironic that it’s not software-driven itself — but haven’t taken the plunge yet. But given the mushrooming scale of this landscape, you’re right, a crowdsourced approach makes a lot of sense. Such a helpful resource, Scott! Thank you for compiling the latest supergraphic—it’s great. We were thinking about something similar to William’s comment … a crowdsourced approach would be cool. On a more simplistic level, would you consider sharing a working database of categories and companies featured? Anything sortable, or searchable, would be interesting. Thanks again for the visual collection of the rapidly evolving space! Stellar update Scott – very very helpful for highlighting how the landscape is changing depressingly fast! I agree with William – following this is hard… to keep it current must be a labout of love! Scott, great job in framing the emerging marketing stack, and for putting so many companies into meaningful segments. I particularly like your category of emerging marketing apps. keep up the great work. Thanks, Chris. I’m very excited by this “marketing apps” category — and not just because my company is one of the players in that space. I think it’s an interesting evolution of content marketing, where “content” isn’t static words and images, but interactive experiences. We’ll see how this develops over the year ahead! Scott thanks for the hard work to collate all this info together. It just helps to understand the competitive landscape faced as we continue to invest in companies. Thank you — glad to hear it’s helpful! Great infographic Scott – the categories you used to define this highly competitive landscape really helps to clarify and segment the various parts of the larger marketing techology puzzle. I wanted to fill you in too on my company – PromoJam (http://www.promojam.com), which is a self-service Marketing App that allows brands and marketers to create social promotions on Facebook, Twitter, Pinterest and Instagram. We really pride ourselves in creating social marketing tools that will help brands get to market faster and smarter. Do check it out when you have the chance! Thanks again for this invaluable resource and wishing you a great 2014! Thanks, Mei! My apologies that I missed PromoJam in this version of the landscape, but thank you for sharing it with us. Great presentation Scott! I am a big fan of Lumascape presentations but I do like how yours includes a comprehensive view of the marketing ecosystem. I predict that new categories of marketing (especially around the area of influencer marketing and advocate marketing) will emerge more prominently in the near future and maybe they will make it on your future list! Finally, is it possible to get emailed the raw data behind your search. It might be useful for doing some internal analysis. If it is, then please email it to abdallahATinfluitive.com. Thanks! Thanks, Abdallah. I agree, Terry’s LUMAscapes are awesome — and much more in-depth in each sector than my broader overview. I agree that there’s tremendous opportunity for products that help with influencer and advocate marketing. Will definitely consider those as their own categories in future versions of this landscape. Regrettably, my raw data isn’t really in a form that can be easily shared. But I’m thinking about how to change that for future versions. Best wishes with Influitive! Scott: Thanks for the landscape supergraphic. I find it extremely informative. I have a small question: Did you consider dividing the marketing automation category into B2B and B2C? Many thanks. Wish you a brilliant 2014! Thanks, Raj! I wrestled quite a bit with these categories, trying to decide what the best level of resolution should be. The difficulty that kept me from further subdividing these categories was two-fold. First, the axes by which the subdivision should be done wasn’t clear. For instance, B2B vs. B2C was one axis; but so could be SMB vs. enterprise solutions. Second, many products would fit in both subdivisions, which seemed like it would make those subdivisions less useful. I’ll be the first to admit that this is a very, very high-level view of the space. A whole infographic could be developed just around the marketing automation ecosystem that could do much more justice to the structure within it. Hi Scott, great job! I’m curious why Nitrogram http://nitrogr.am was left out in social media analytics? Any particular methodology? We’re focused on Instagram, but we hope we’re pretty good at what we focus on… Thanks! Thanks, Gabriel. Regrettably, I have no good reason for missing Nitrogr.am in this landscape. Thank you for bringing it to my attention though. I confess, it is very humbling to realize all the amazing companies that I inadvertently overlooked. But there’s always the next version. Best wishes with your venture in 2014! Thank you for the clarification Scott. Better luck next time. Scott, thank you for featuring Padiact (http://padiact.com) among the Email Marketing Technologies, glad we made the list. We have to say, it’s impressive what you collected, and we want to thank you for the work. It actually helps us understand better the “world” around us. Also, about being featured in the supergraphic, we feel that this is like an achievement, as we helped collect over 3 million leads for our clients so far. Thanks, Gabriel — I’m glad you’ve found it helpful. I have to say, I really enjoyed learning about so many great companies such as yours while researching this. In particular, the innovation that’s happening around the “email marketing” space is simply fascinating. Best wishes with Padiact in 2014! Awesome work, very useful! If I may, let me introduce our company, DashThis (http://dashthis.com) which is a reporting / dashboard solution. It’s more reporting than dashboards like would be Geckoboard, but I feel like our hard work over the past 3 years earned us a spot in such graphic 🙂 We are one of the few Facebook Ads and DoubleClick Search authorized integrators having clients like Hershey’s, Nestlé and Fiat among other things. Anyway, I’m not blaming you, doing such inventory is a tremendous task. Hi, Stephane — Happy New Year. Sorry that I missed you guys in this landscape, but thanks for bringing it to my attention. Will definitely have you in mind for the next version. Compliments for this impressive infographic on marketing technology. You may have overlooked us in the DAM category? With Elvis DAM we are highly active in the DAM space globally (as covered by Real Story Group, Forrester). In the last year alone we welcomed customers like Time Inc, WPP, Sky broadcasting, Yamaha, American Apparel and many more. We serve those customers together with our 100 business partners covering 120 countries. The Elvis DAM product is highly scalable, easy to use, and stands out in high performance search, even for customers with >100 million assets. Thanks in advance for noticing us! Hi, Bastiaan. My apologies that I overlooked you. It sounds like you guys are doing great. I’ll definitely keep Elvis DAM in mind for the next version. Thanks for chiming in! Scott, this is a great graph and great article. It’s an excellent reminder that we all have more to learn, which is an exciting prospect in itself. Thank you! Great work Scott. I think the 6 main buckets and the hierarchy make perfect sense. Love to work with you on making this interactive. A marketing capabilities matrix tool that people could use to evaluate which of the sections are core to their strategy and what vendors and services they have. This would allow a gap analysis and a roadmap for each organization but capture trends and allow for collaboration with others in the industry. Thanks, Shawn. I agree — the visualization is interesting, but it’s clear that a programmatic back-end to this project would open up a lot more possibilities. I’m definitely noodling on that. Brilliant content – a really impressive collection! For the Agile Project Mgmt. you may also want to take a look at http://kanbantool.com – I believe it’s much better, and definitely with bigger user base than some of the other tools you’ve mentioned. KanbanTool looks great! So sorry that I missed you guys in this landscape — but thanks for letting me know. Hi Scott. Your landscape prompted much discussion here at Raab Associates, although I’ll admit I did most of the talking (the cat just listens). Your distinction between “backbone platforms” and “marketing experience systems” in particular is one that we’ve not made, since our simpleminded view is that both sets of products draw their data from the Customer Data Platform / middleware layer. But I think the distinction makes sense: intuitively, there is a significant difference between the primary systems like CRM, MA, Web, and eCommerce and the other secondary systems. My question is whether you’ve come up with a more formal definition of the two categories and their relationships to each other and customers. Contrary to your post, it seems to me that the backbone platforms are in fact customer-facing; indeed, they are the primary delivery systems in their respective channels. The marketing experience systems often modify messages created by the backbone system, for example by inserting a personalized message or promotion. But this isn’t always the case — an email system, which you classify as an experience system, delivers messages directly. I also wonder whether the same experience system could be deployed across multiple backbone platforms — many of them would be limited to just one, but some might not. To the extent that they do feed multiple backbone systems, would this make them part of a middleware layer, or perhaps lead to redrawing your diagram so the backbone and experience layers touch directly rather than being connected through middleware? This isn’t just a matter of moving boxes on a Powerpoint: the real question is whether one approach better than another — that is, SHOULD the experience systems communicate with the backbones through the middleware rather than directly? I could certainly see an advantage to that, since it would ensure that recommended experiences are available to all customer-facing systems. But it also introduces another layer of complexity. Much food for thought. Thanks again for sharing this and I look forward to reading your more detailed explications. David — you raise some great questions. The thinking that got me to this layout was that CRM, WCM, MAP, and e-commerce seemed to be the common “must have” components across almost all marketing organizations. The far majority of marketing efforts out there emanate from these core products. Combined with the fact that those vendors have been increasingly building partner ecosystems with more specialized point solutions led me to label them as backbone platforms. You’re absolutely right that most of the “marketing experiences” that are produced today are created and delivered directly by these platforms. For that matter, a lot of what is done in “marketing operations” today is deeply entwined with them too. The red and orange marketing experiences and marketing operations categories are, at least to me, more point solutions above those platforms. (I’d note that line between operations and experiences is actually quite blurry in practice; all those analytics solutions on the right side of the graphic are immensely critical to shaping great marketing experiences.) But for the sake of having some organizational heuristic: the red categories were generally any products that directly touched prospects/customers — and that weren’t already in the platform layer. The middleware layer is the most interesting to me — but arguably the hardest to quantify. My informal heuristic was: any software that wasn’t already a platform but was interfacing with many other products across the landscape to make them collectively more effective. It could be debated whether CDPs really deserve to be more at the platform layer instead. After all, they’re not just “connective tissue” — many are bringing higher level business value (i.e., cross-channel customer experience optimization) through that connectivity. My only reason for not putting them at the platform layer was that, as promising as they are, CDPs are not yet “must have” for most marketers. I expect that will change, maybe even quite quickly. Which brings us to your question: do we need middleware or can platforms serve as the coordinating devices across all those other point solutions directly? My thinking at the moment is that it’s not a requirement, but it may be quite helpful. It may be helpful to marketers because it can simplify integrations, create more synergies across products, and — interestingly — counter some of the potential lock-in dangers associated with “one platform to rule them all.” And it may be helpful to marketing technology vendors (other than the big platform vendors) because it makes specialized point solutions more viable, especially if they’re competing with features inside the major platforms. These are just some preliminary thoughts though. I’d love to discuss this further with you. Hi Scott. It’s great to watch all the comments pour in, highlighting how many more vendors there are than anyone knew. It’s a vibrant space indeed. – analytics solutions that directly drive interactions might fit better in your middleware layer, if it’s defined as systems that are “interfacing with many other products across the landscape to make them collectively more effective”. Since I seem to be in hair-splitting mode this morning, I’d also point out that I believe your landscape is intended to describe the existing set of vendors, not to prescribe an ideal architecture. So it’s not a flaw if it doesn’t reflect an ideal future state. What you’ve done is begin to provide a shared vocabulary that makes it easier to have the prescriptive discussion, which is itself a valuable service. Thanks again! Hi Scott, Incredible piece of work. Congratulations! And thank you for placing Kwanzoo in the “Display Advertising” category. We see ourselves also play in several other categories within the Marketing Experiences class, given that the rich media ads and content that marketers build on our platform integrate into backbone platforms (MAP, CRM, WCM), marketing operations (Data, Analytics), as well as several other categories within Marketing Experiences (email, mobile, video, social, and event platforms). This is precisely what we do at Kwanzoo. Try to make it really simple for demand marketers to build and launch rich, interactive, marketing experiences against multiple backbone platforms, across digital channels (from display & retargeting to website, social and mobile) Make sure the prospect experience is as intelligent / personalized as possible, by leveraging all prospect data available from an MAP / CRM / IP data provider. We also write back to MAP prospect profiles, so they are even richer for future interactions. To David’s point, we directly play across the backbone and marketing experience classes / layers today. And we definitely see strong interest from B2B demand marketers to do just that. We do not integrate into CDPs and DMPs today but hopefully the market will drive us there at some point. But the bottom line is, we believe there is significant value for marketers from tools that can simplify all the myriad integrations they would otherwise need to deal with everyday to create a compelling interactive experience for their customers and prospects. Thanks again for bringing some clarity to a very confusing space. It will help drive adoption of new technologies faster, which is a good thing! I was chatting with David last week and he mentioned this dialogue here with you. This is really getting to the heart of a big transformation that is happening in our market. I’m with the company David mentions here called Provenir, as part of this new emerging category. In essence, we have a real-time orchestration hub that enables brands to orchestrate omni-channel customer journeys across their existing touch points, systems and data – without ripping and replacing systems and without creating a new database to manage. A completely channel-agnostic and data-agnostic system, the rules and journeys are managed centrally in the hub and can be applied to any touch point, or combinations of touch points, in real-time. The system, which sits in the cloud, “listens” to events within data across these systems and touch points, assembles a virtual real-time view of the customer from across the databases, and then uses this information to produce a real-time decision as to what the best-next-action will be for each individual customer (in accordance with where they are in their customer journey). We’ve seen tremendous traction over this past year, in particular with marketing agencies (see your recent comments on their drive to software and solutions) and the approach really seems to be taking off. It would be great to connect and share some details on the solution. I thoroughly enjoyed this article. I admire the way you organized the various marketing technologies very accurately into categories. I also like the order that you gave the six classes of technology. I would like to nominate and introduce WhatRunsWhere (https://www.whatrunswhere.com/). Within this supergraphic we would fall into the Marketing Operations class, classified under Marketing Analytics. We are a powerful competitive intelligence tool that helps online marketers see exactly what display and mobile ads are running where. Tracking data from over 90 display networks, over 100 mobile networks, and over 150 thousand unique publishers in each of the 15 countries it covers. Super powerful for keeping a eye on your competition’s campaigns! Thank you, Danielle — glad you enjoyed it! My apologies that I missed WhatRunsWhere. Sounds like a great service! Consider it nominated for the next version of this landscape. Hi Scott – I love this Supergraphic. Have you thought about making it ‘searchable’? One simple solution would be to offer a companion .xls with company names and categories. For instance, I was surprised to not see Vindico on the chart, but maybe you just have them in a category where I wouldn’t expect to find them. Great work! Yes, I agree. I’ve been tackling this mostly from a perspective of visualization, but it would be much better to have all the underlying data available in a format that would make it easier to search and do other analyses. Thanks for the nudge! Agreed! I love this graphic (hat-tip, Scott), but it would be much more useful if I could extract the list of companies/products/services to build a map of how my company uses them. My 2¢… I didn’t see Yelp, Foursquare, Citysearch, MerchantCircle, and Tripadvisor in the Communities/Reviews section. Did I miss them, or were they just overlooked? Either way, thank you for the insane amount of effort this graphic took to produce. Thanks Scott — Great to see a new approach to organizing the industry we love. Should you take another pass at the landscape, the team here at AdColony (www.adcolony.com) would be happy to show you how we might fit and provide insights on the goings-on in mobile video advertising. We’re the leading mobile video advertising network, and we’d fit comfortably in the Mobile Marketing section, with Video Ads & Marketing being a very relevant category as well. Here’s the CliffsNotes version of what we do — reach out anytime you’d like a full briefing! AdColony is a mobile video advertising company whose proprietary Instant-Play™ technology serves razor sharp, full-screen video ads instantly in HD across its network of iOS and Android apps, eliminating the biggest pain points in mobile video advertising: long load times and grainy, choppy video. As a leading mobile video advertising and monetization platform, AdColony works with both Fortune 500 brands and more than 70% of the top grossing publishers in the App Store, reaching over 150MM monthly uniques. AdColony is an Inc. 500 Fastest Growing Company and was shortlisted in the Top 10 on VentureBeat’s Mobile Advertising Index. Hi, Molly — thanks for the CliffNotes introduction to AdColony! Sorry that I missed you on this version, but I’ll have you in mind for the next release. Hello Scott – Thanks for putting all the time and effort into this. This provides a valuable resource for anyone trying to figure out this continually morphing space. One change that is worth tracking is the move of enterprise-level email service providers to being full-fledged cross-channel marketing providers. Your Marketing Automation category can capture some of that, but a lot of Cross-Channel Campaign Management providers like my company StrongView and competitors like Exact Target and Responsys offer campaign execution as well as marketing automation. I see you put StrongView under Email Marketing, but that’s a little misleading for us and others in that box like Experian and Epsilon.We all do email very well, but at least for StrongView’s part, we see it as the foundation for integrated cross-channel campaigns where we also bring in mobile, social and display. There’s a lot of innovative blending across campaign and customer experience technologies. I think that’s great, but it does pose a few challenges for trying to categorize folks into a graphic like this. But I may have some better ideas for that in the next version. This is incredible, nice work Scott! It is certainly exciting to be involved in this space since I think 2014 is finally going to be the year that marketing technology really takes off into the mainstream as it begins “to click” for more and more companies starting to realize the amount of money being left on the table by not analyzing, testing, optimizing and tracking everything they possibly can to constantly increase the ROI of their advertising and marketing campaigns. The old adage that “half of our marketing efforts are working and the other half is not, but we have no idea which is which” is not going to cut it much longer. I’d also like to chime in and ask you to consider our marketing analytics platform called Convertable (http://convertable.com) that I think would fit in a couple of different categories in your next marketing landscape supergraphic. At its core, Convertable combines web forms, analytics and lead management. It tracks leads generated through web forms all the way through the end of the sales cycle so you can finally attribute the revenue generated back to its original source (and every visit for more accurate attribution rather than simply last click) in order to truly measure ROI. Our goal is to bridge the critical gap between web analytics and offline sales by providing a simple yet robust closed loop marketing platform, and one that is better suited and more affordable for smaller businesses who may not necessarily need a full blown enterprise level solution at this time. We have had thousands of companies sign up already for our free beta and we plan on launching our premium plans in the next few months. Anyway, thanks again for putting this all together and I’m looking forward to what lies ahead for all of us in the year to come! Thanks, Patrick! It’s great to see the ghost of John Wanamaker finally being put to rest. My apologies for missing Convertable in this release, but I’ll definitely have you in mind for the next one. Best wishes with your venture in 2014! Very nice update Scott. It would be nice to include Appnexus too. Thanks, Pipe — consider Appnexus nominated! This is an amazing project you took on and I applaud you on your results! I work for Appuri, a relatively new startup company in the Customer Data Platform space and I’m very impressed on how you’ve been able to capture such a complete snapshot of the current market; and specifically pertaining to our space, on how well you’ve been able to describe the “software glue” that we are providing and how you’ve explained the challenges that we help solve! We are working on building on top of our Data Platform to become a Business Intelligence and Analytics solution and we’ll update you when it happens. Until then, great work here and I’ll be sure to follow your blog from here on in. Thanks, Edmond. I’m very intrigued by solutions such as yours in this “marketing middleware” category. Whether or not that’s the right label for this is certainly open to debate. But with the direction that Appuri and others in that cluster are taking, it’s very clear that you’re more than just “connective customer data tissue” — you have great potential to deliver possibly the best business intelligence within the marketing space. Good luck in your mission! Dittos on all the praise above. I found very interesting your line about the “seismic shift of marketing away from advertising to experience-driven marketing.” I wonder if what we’ll see ultimately is a shift from one thing to another, or more of a convergence? e.g., will online advertising start to resemble direct marketing/CRM, with both driven by a single technology? Same question could apply elsewhere — where is there/will there be meaningful convergence, as opposed to further fragmentation? Great point, Alan. I do think that advertising will continue to exist and innovate as a significant piece of the modern marketing puzzle. In the process, the boundaries may indeed blur and merge in interesting new ways. Your idea of convergence there is very intriguing! Any by the way, in the next version, RedPoint should go in the “Marketing Automation/Integrated Marketing” category, as well as in “Data Management Platforms/Customer Data Platforms.” Convergence at work! Amazing to see the expanse of our marketing technology ecosystem … and its growth over the years! Really gives some perspective to what we’re doing. For Agile & Project Management, we’d love for you to consider SocialBridge by Central Desktop (www.centraldesktop.com). SocialBridge was developed specifically for marketing agencies and departments and enables internal and external teams to predictably create successful campaigns. Users can share files, manage projects, centralize communication, review and mark up creative assets, and streamline creative and operational processes all in the cloud. And our customers are doing interesting things with our software, like managing creation of commercial video spots for primetime TV shows and major campaigns (such as the Super Bowl), launching new frozen yogurt flavors, working more closely with clients on campaigns, bringing educational television programs to children around the globe, publishing sports highlights and stats, etc. We’d be happy to show you how agencies and marketers are using us, what results they’re getting, and how we fit into this landscape. Thanks for the interesting article and graphic! Thanks, Linda — it is a pretty wild ecosystem when you see its scale like this, isn’t it? And as it turns out, this clearly doesn’t do justice to all the amazing companies that are in this space that I failed to include. CentralDesktop being one of them! Thank you for alerting me for the next version. Thank you for considering us for future versions. What an immense amount of information to juggle! And kudos for the positive, personal responses on everyone’s comments. Thanks, Adam. Addroid looks cool — will have you on my radar for the next version. Thanks, Matthew — I’ll keep Hiwyre in mind for future versions! Great supergraphic Scott! Amazingly useful to brands, agencies, and third parties alike! If possible, we would love to see ShareRoot incorporated in the Social Media Marketing group. Thanks again for this Scott! Thanks, Noah. Great to see what ShareRoot is doing with Pinterest marketing. I appreciate the heads up to have you in mind for future versions of this landscape. Thanks Scott for having http://www.inboundio.com/ in the infographic. Your yearly technology landscape infographics are becoming industry standard now as I can see them getting quoted so often! Thanks, Pushkar — best wishes for 2014! It looks like TYPO3 isn’t that appreciated in the US like in Europe. Thanks, Alin. Sorry that I missed TYPO3 in this version — thanks for letting me know for future versions. Really cool work with landscape! Would be nice to see Integround, http://www.integround.com for the cloud connector listing. We are a startup from Northern Europe working with process automatization. Marketing automatization is really gaining momentum on the European markets. Thanks, Fredrik. Interground looks great — I appreciate you letting me know. I’ll have you in mind for future versions of the landscape. Best wishes for 2014! And that’s the essence of this blog: the need for marketers to become marketing technologists. On a related note, I’d like to mention that DNN (my employer) provides solutions for Web Content Management (Evoq Social) and online communities (Evoq Social). Readers can find more information at our website, http://www.dnnsoftware.com. Couldn’t manage to find anything referring to pricing in that graphic. Hello Scott–I’m not a marketing or marketing technology guy, but a simple mathematician. I applaud your work here, I have no doubt that it is an accurate portrayal of the marketing technology space. I hope you are the kind of person who will be open to a little constructive criticism from an information design standpoint. The colors are wrong, the text is improperly used, it isnt a “landscape” (that would be 3D), the logos don’t really add anything. The information content is really a list – one where the information of the logo adds no new understanding. Some logos are bigger than others – but again this is not a data attribute. I could go on at length here. Please understand that I think your work in this area is noble. I just think that your “landscape” could benefit from a well rounded information design. Hi, George — thanks for the constructive criticism! I actually appreciate it very much. I agree with your main point that from an “information design” perspective, this graphic is far from ideal. Edward Tufte would no doubt scold me (especially since I’m using his “supergraphic” term for this). There is an interesting debate worth having about information vs. aesthetics — how much something is intended to communicate knowledge vs. trigger more emotional reactions (whether those emotions are joy, fear, disgust, inspiration, etc.). I realize that there isn’t necessarily a Pareto trade-off between those two objectives, and I’d like to do better on both axes. If you have more detailed feedback, please do email me. There will be future versions of this, and I’d love to know how I could make it better. Thanks again! Hi Scott–Thanks very much for your reasoned response…yes I will email you with a few pointers and ideas. I think the work that you are doing is excellent and I hope I can offer just a few mechanisms to help it scale from here forward. Scott, This is teriffic work and a true labor of love. You are right about categories. As new needs are discovered, companies in one space are quick to move into an adjoinung space and offer new solutions. It is expotential. I hope that this is work for your dissertation. You have truly added to the body of knowledge available in our industry. Scott, thank you for an outstanding and compelling summary of our industry. I invite you to check out Amplifinity, a Social Media Marketing company. Our software allows large brands to identify, track and manage brand advocacy across social networks. We supply our software to many Fortune 500 companies. Our technology is primarily used to optimize customer referral programs, turning customers, partners and employees into permanent sales channels. Thank you for the heads up on Amplifinity, Eric! Scott, your landscape is missing the Canadian #engagementlabs !!! We are social enablers and are totally focused on providing social engagement technologies extracting collective (business) intelligence for our clients. We offer our #esuite™ a Saas technology supporting the entire social marketing cycle. We also provide the analytics, insights and intelligence that go with it. We cater to our clients needs by offering them the means to take their social media engagement more effective and valued! Today, social marketers are immersed in non-actionable, BIG data. At #engagementlabs, we transform big data into actionable data. We support their entire social marketing cycle, from data they want, to insights they need leading to conversions they crave. Interested in having a tour of our products, just visit http://www.engagementlabs.com/ to request a demo. Sorry I missed #engagementlabs, Julie — thanks for letting me know for future versions! Thanks, Kevin. I completely agree that this graphic is mostly just a conversation piece. There’s surely a whole consulting industry that will be making billions of dollars helping companies figure out how to best take advantage of all this blossoming landscape. As per our twitter conversation, just wanted to both add my praise for such a great job and the massive amount of work you must have put into it yet again. Whatever people’s take on it, it provides fuel for some excellent debates. I should also point out that Adestra (http://www.adestra.com) is missing from this latest cut. I won’t presume to suggest which category to place us as yet, as I’m sure the next iteration will come with more changes to those. We can discuss that nearer the time! Thanks, Steve. Sorry I missed Adestra — was not an intentional cut at all. Thanks for reaching out to let me know for future revisions. Categorization is a challenge unto itself. I’ll be the first to acknowledge that my choice of categories and who ended up in which categories is highly imperfect. Given all the overlap of innovation across the space — which outside of the challenge of categorization, I believe is a good thing — I suspect it will be increasingly difficult to make black-and-white distinctions across this field. But I’m optimistic that there may be better ways to organize graphics like this. Excellent, thanks a lot for sharing Scott ! By the way, is it too early (market maturity) to add a list about omni-channel attribution companies/agencies? Thank you! The line between technology vendors and agencies is fuzzy in a number of cases — and I suspect may become even more fuzzy in the years ahead. It does make categorization more difficult. I almost feel that there should be an agency landscape like this (produced by someone other than me). But the “omni-channel” label has been gaining a lot of momentum. There are clearly some companies that were launched under that banner, but there are also a large number of other vendors who are pursuing an omni-channel product vision. I’d love to hear of any companies that you think particularly epitomize omni-channel attribution technology. Hi, discover Teads.tv , our video ad platform. Hi, Olivier. I love your global video landscape — that’s great! Thanks for sharing and letting me know about Teads.tv. Really a great chart – and a big challenge in keeping it updated to market changes! It’s actually been fun to work on this. (Although that says a lot about my warped sense of “fun.”) Thanks for the heads up on Inxmail for future revisions of this graphic. Another marketing automation technology to include in your list is MindFire Studio (http://www.mindfirestudio.com/). Our platform is uniquely built to meet the needs of agencies and marketing service providers. Hi, Ramin — sorry that I missed you guys on this version. Will definitely keep you in mind for future revisions! As much as I enjoy looking at the graphic – as I’ve done with your past versions – I can’t help but be struck with how much time it took to actually compile and arrange it all. It’s too bad that there’s no way to automate some of the process to make it easier to maintain, especially considering how much some of these spaces evolve and transform. If/when you take a look at the landscape again, I’d really appreciate it if you would consider the company that I work for – http://www.higherlogic.com – for inclusion in the Communities & Reviews category. Regardless, I’m appreciative of the work and really think it’s a great resources. Thanks! Thanks, Dave! Yes, there should be more technology behind this graphic — more than a little ironic that there currently isn’t. I’ll definitely keep Higherlogic in mind. Hi, Tam — missing AppNexus on this was one of the more egregious oversights on my part. I’ll rectify that in the next version. Thanks for the nudge! Thanks, Jay. Regrettably, I don’t have this available in Excel or Google Docs — but I really should. Noted for the next time I revisit this project! Wonderful work, that had to take some long hours to make. Thanks for sharing! Thank you! There were many hours, but actually, this was quite fun to do. Hey Scott. Great list of companies. I noticed that Amobee (www.amobee.com) was not included in the Mobile Marketing section. Amobee is one of the largest and most sucessful mobile advertising players in the ecosystem (both on the demand and the supply side), with global clients including Expedia, Google, Nokia, Samsung, and Skype. Hi, Eli — sorry that I missed Amobee. Thanks for letting me know for future revisions! Thank for sharing this, Scott! I work at Acxiom and having this info graphic is extremely helpful in understanding the scope of the overall landscape. One idea for future publications: have 2-3 leaders highlighted in each category. Not sure if this is possible since there are so many biases and opinions but just throwing it out there. Thanks, Divy — I happy to hear that you find it helpful! I agree, it would be great to have more information embedded in this, such as the “leaders” within certain categories — and perhaps more subdivision of categories, to separately recognize SMB leaders vs. enterprise leaders, B2B leaders vs. B2C leaders, etc. There are challenges there with (a) defining the axes of leadership, (b) getting accurate data to define the leaders, and (c) figuring out how to present it. But challenges that are worth tackling, albeit possibly in a different incarnation like an interactive app. Fantastic! We have a client that’s missing from the Sales Enablement section, TinderBox – at http://www.gettinderbox.com – they have a SaaS proposal platform that’s integrated with Salesforce and incredible. It has theming, reporting, red-lining and templates. Hope to see it on the next! Hi, Douglas. Thanks for the heads up on TinderBox! This is amazing. Do you happen to have a list of these companies with their url’s. While the visual landscape is truly enlightening, having a directory I can actually reference and use would be even more useful to me. Thanks, David. Regrettably, I do not have such a listing at this time. But I agree, it would be immensely helpful. Great graphic and overall picture of the landscape. I think it’s great how you publish this and then everyone who you missed comes and leaves comments 🙂 I think that there are actually way more companies than the 900+ that you’ve listed here, but this is a really excellent list. I’m also happy to read your analysis around how the marketing integration space was a new and exciting piece of the puzzle that you found in your analysis. Our company Bedrock Data (http://www.bedrockdata.com) is focused on just that — we’re providing data driven integrations and data management on a lot of different platforms, mainly between various CRMs, HubSpot and Marketo to date, but are going to be expanding to include support, financial and other business back end systems. We’ll also be providing backup services and APIs in the near future. Just wanted to make you aware of us, thanks for all your hard work here! It’s helpful for the whole community. Thanks, Adrian. I agree — there are WAY more companies in this space than the ones shown in this graphic. I’m going to have to figure out some better visualization options, or move to a bigger canvas! Thanks too for the heads up on Bedrock Data. I’m very excited about companies in that “middleware” space. In addition to the immediate value that can be provided by simplifying integrations for marketers, I believe they’ll be a bridge to bigger future of more specialized marketing applications that will be better able to plug into the ecosystem. Will definitely keep you in mind for the version! Great work Scott. Very helpful in dissecting and understanding the various elements of the martech equation. It would be great to get AWeber (www.aweber.com) on your radar for the Email Marketing landscape. We’re a 15 yr old company in the email space successfully servicing SMBs, bloggers and content marketers. Thank you, Eric. Sorry that I missed AWeber — especially given the company’s tremendous longevity in the space. Will aim to rectify that oversight in the next release! Thanks, Stuart. You wouldn’t happen to have a version that also has your company name in it? The company name is there, because it’s transparent you can’t see it 🙂 Will show on your grey background. Thanks a lot for publishing the Marketing Technology Landscape which is great to get an overview of all kinds of software and platforms. And it also shows the complexitiy of the markets. We really appreciate it. As a provider of Content Management und Product Information Management Solutions we will be very happy if you could have a look at our products pirobase CMS, pirobase PIM (http://www.pirobase.de/homepage-pirobase-cms-pim) and imperia CMS (http://www.imperia.net/imperia-9-1/index.html.en). We will be glad if you could take them into consideration when reseraching for the next landscape. Hi, Annette — thanks for giving me a heads up on Pirobase and Imperia! I’ll definitely have them on my radar for the next version. Great one, Scott. Kudos in making this ‘one-reference-point-for-all-things-marketing’! I work for Zoho and glad to find Zoho listed under CRM. Zoho also offers a lot more services and it would be great if you can add Zoho Campaigns (under Email Marketing) and Zoho Reports (under Business Intelligence) in your next version. Thanks, Aravind — glad you’ve found it helpful! Thanks for calling my attention to Zoho Campaigns and Zoho Reports. I didn’t always do justice to companies that I had included in a platform category in the other categories in which they also offer stand-alone products. Sorry for the inconsistency on that. I’ll aim to fix that in the next version! Thank-you for including us in your marketing landscape. While content marketing is a natural outcome of our software here at Ceros, we feel that we’d be best represented under the ‘creative and design’ section of your marketscape – since those elements are a much bigger part of using our software than content marketing. If you do plan on doing a 2015 version of this market-scape, can you move our designation to ‘creative and design’? Thanks, Geoff! I did include Mixpanel in the Web and Mobile Analytics category (right above the Business Intelligence category). I’ll admit, the lines between those categories are fuzzy. I’m actually a huge Mixpanel fan — we use them at my company. Thanks too for the heads up on Selz for e-commerce — will definitely consider it for the next version! Do you happen to have the company names in a list format? Thanks for chiming in, Dre, and pointing me BuzzRadar. Looks like a great project you showed off at CES! Awesome graphic, Scott. it looks like you missed FastSpring in the E-Commerce category. Perhaps it can be included in your next version. Thanks, Dan. Sorry I missed you guys on this pass, but I appreciate the nudge for the next version. Best wishes with FastSpring in 2014! Hi, Rhonda. Thanks for the ping on Repubhub. My attempts at categorization are far from perfect or definitive, but I’d probably loop you into the Content Marketing category. Of course, categories will certainly evolve, split, change, etc., as things move forward — will be interesting to see! Thanks Scott. The list is comprehensive and informative. The idea of categorizing each segment looks good. It should have taken enormous amount of time to come up with such a comprehensive list. Appreciate your efforts and Thanks for including our content marketing tool “Voraka” into the list. We believe content marketing is evolving and will be a game changer in all the marketing activities for 2014. Thank you, Krishna. I agree — content marketing, and the software that’s rising to serve that opportunity, is definitely an area to watch. Best wishes with Voraka! Beautiful and almost overwhelming list of technology. From start ups to industry giants. Well done! Looking forward to seeing Cinsay on the list somewhere around the eCommerce region! Our latest update allows users to not only buy goods and services inside the video, but also make donations, enter contests, subscribe to newsletters and embed into Facebook. Thanks Scott for the info and tweet! Thanks for the heads up on Cinsay, David — sounds very cool! Great supergraphic! I would be curious to hear more about the use/evolution of middleware AND your thoughts on where BrightTALK would fit. Drop me a note when you are in San Francisco next! Thanks, Kaitlin. I can’t believe I missed BrightTALK. My apologies! Nice work Scott! Absolutely Customer Worthy! Now map the systems/vendors to departments for an individual company and see why companies muck this up – “dydfunction junction” + customer/channel/program ownership and internal politics issues. See graphic at bottom here for http://www.customerworthy.com/cxc-matrix-benefits-it-systems-management to connect customer experience path to technology mash-up. I’ll send you copy of Customer Worthy via PDF if you’d like to see approach for companies to monetize investment in these technologies measured by revenue impact and customer impact. just send email to mrh@custoerworthy.com and I’ll send. Thanks, Michael. Looks like a great book — I’m eager to read it. Hi Scott – It is great to see the vast world of marketing technology all in one place. Unfortunately, you missed ProofHQ (http://www.proofhq.com/), a part of the Marketing Resource Management category. We offer an online review and approval solution for marketing and creative teams to deliver content faster and more efficiently, across a wide range of print, digital and audiovisual file types. Hi, Gail. Sorry that I missed ProofHQ, but thanks for chiming in. Thanks too for the demo link with the graphic — that’s cool! Hi Scott, thanks for this, very helpful…any chance you have all these companies listed in a list format? As always, your work is amazing! This is a fantastic reference tool and I’ll be sharing it as an Update to my network on LinkedIn. Since you’re taking suggestions, please look at cmp.ly for Social Media Marketing; I’m a fan of their Command Post. Great Landscape! I’d love to know where you’d slot in our company (http://www.avoka.com/customer-engagement-management) . We have a platform that enables organizations to rapidly build multi-channel customer engagement web applications – by the business or marketing team – so no coding. It spans eCommerce, Web Development, Mobile Web Development. We often say its akin to WCM – except for building Customer facing Web Apps. Thanks for including Lavastorm Analytics. It’s amazing the growth in vendors over the few years you have been tracking this. The scary part of this for any marketer is how to pull it all together because these systems are generally all silos of information. Some BI tools like the Lavastorm product help integrate different data sources, which is a help for most marketers. Over time, I would expect some consolidation and aggregation of systems, but the need for an overlay system to pull things together will remain for a long time. See my blog here: http://www.lavastorm.com/blog/post/analytics-and-big-data-are-driving-the-need-for-marketing-integration-and-new-skills-for-marketers/. Scott, could you please consider placing RTB House for the next revision (field: Dispaly Ads)? RTB House is a technology agency with worldwide operations. Creator of technology for buying inventory and displaying adverts in the RTB (Real-Time Bidding) model. Author of a unique algorithm for personalized retargeting. Provider of effective solutions aimed at supporting clients in selection of advertising messages to groups of potential customers defined by their online behaviour. RTB House operates on 28 markets in Europe, Asia, and northern Africa, including: Poland, France, Germany, Bulgaria, the Czech Republic, Sweden, Spain, Morocco, Turkey and the Netherlands. The company is currently running over 450 advertising campaigns. For its clients buys 2,5 bn. views per month. Great job, Scott. As per our conversation, I’d like to request that UserZoom be added to the list. Since we’re an all-in-one solution for digital customer experience management, specializing on VOC and online research and testing, I’d kindly request that take us into consideration under “Customer Experience & VOC” and/or “Testing and Optimization”. Thanks in advance and again great work! Great infographic! I think it’s great that you came out of retirement to create another marketing technology landscape since the industry seems to be evolving by the day. I wanted to keep you updated on JiWire, a location-powered mobile advertising and data platform. Leveraging proprietary historical and present location data, JiWire enables advertisers to effectively engage their desired audience across all mobile devices at scale. Let me know if you have any questions as we hope to be on your radar for the next infographic. Scott, great connecting today – wanted to make sure that Scribe Software (www.scribesoft.com) stays on your radar as an innovative cloud connector provider – looking forward to the next update and coffee! Agree this was a laborious undertaking – admire your tenacity! I’d like to respectfully point out as one of the leaders in Advocacy Marketing, Amplifinity develops and manages some of the largest, most long-term advocacy and referral programs among enterprise companies in the U.S. and we are not represented on your graphic. I understand that mistakes and mis-categorizations are sure to happen here, but this could have been averted by contacting the company prior to listing them where you think it might make sense. Even more odious a task? Definitely. But more balanced, accurate and representative of this landscape? No question. Additionally, you missed two HUGE categories here – [Brand] Advocacy Marketing and Referral Marketing Programs. Most online vendor directories consider it a best practice to invite companies to submit their own company information prior to publication (in order to avoid erroneous placements; in order to place companies in the most accurate category, and in order to allow companies an equal opportunity to represent their technology). Finally, as a journalist or other communications professional with the power to share information to a worldwide audience that may be used for practical purposes, it is prudent to take all the steps necessary to ensure that information is accurate and as inclusive as possible. Appreciate the chance to be a part of the conversation, Scott. Love the categorization schema, Scott – makes this very readable and helps navigate a complex landscape! I’d humbly request that you consider Invodo for inclusion next time around. We fit within the video marketing space: helping enterprise clients like Verizon, Sports Authority and Lenovo deploy and measure video content across their sites in a way that drives revenue-generating results. – As part of Web analytics, Social Media Analytics and sentiment analysis could be added in my opinion. Scott – great analysis. You should definitely consider adding Sideqik to it in your next version. We help companies with partnership marketing and cross-promotions. Great list, thanks for putting this together! It’s a shame my company Ambassador (http://getAmbassador.com) was left out. Ambassador helps hundreds companies track & manage referral, partner and affiliate programs. In fact, a few dozen of the companies listed are Ambassador customers! Scott, first time visitor to your blog but have been keeping my eye on Ion Interactive’s opinions for a while now. Very insightful. This “Supergraphic” is indeed an indication of the evolution that currently is well on its way. I do think however that while certain people may not have been included some of the included will find themselves battling for survival in the years to come (as is the case with any evolution). I feel this will especially be true for the Experiences and Operations categories. Many providers in these spaces bank on a handful of established internet platforms. And with the drive these platforms have to make their use profitable for businesses while wanting to generate additional revenue for themselves, I don’t think it would be specious to hypothesize that they’ll start doing many of the things themselves. Couple that with the acquisitions and partnerships of these platforms with the really breakout performers (Google & Wildfire as an example) and I think you’ll have a smaller more robust set of players in these spaces. Thanks for this information. I have tried to compile something like this myself before, to no avail. This is great to examine the current Marketing Technology Landscape. The six classes of marketing technology breakdown is excellent. Thanks. This is insanity, I had no idea how diverse the marketing industry was! I loved your point about archaic management tactics causing bottlenecks, and not technological limitations. Hopefully the increasing sophistication of marketing tech will remove some of the bureaucracy of agency structure! Great graphic. Thank you for bringing clarity to an ever-changing and highly complex landscape. Hi Scott, excellent analysis and very useful overview of what the industry looks like from a bird’s eye view. I really appreciate the amount of work and dedication you have put into the successive releases of this fantastic map, and would like to humbly suggest a couple tools that could help you streamline and make this work not only more accessible and shareable, but also open to more effective suggestions and contributions from your own readers. The first tool I’d suggest to give a try to for your next iterations is Zeef.com. Actually, in the map itself there are certainly some potential valid alternatives to your present approach. As I am interested in organizing and curating large collections of tools and resources, I’ll keep an eye open for you and for new effective alternatives will emerge on this front. Thanks again for your inspiring work. Scott this is very impressive, thanks for putting this together. I’d like to make you aware of BrightInfo, which is a new vendor in the personalization space, helping businesses increase engagement and conversion automatically. Will appreciate you including us in next revisions of this. I’ve just seen your Marketing Technology Landscape and I have to say it’s very impressive and it’s a great source of information. I represent Benhauer, a producer of a Marketing Automation system- SALESmanago. As you can see below, Datanyze published a research conducted by Alexa, in which SALESmanago takes the 12th position in the world’s Marketing Automation market share ranking (http://www.datanyze.com/market-share/Marketing_Automation/). That’s why we would like you to situate SALESmanago in the Marketing Technology Landscape. We will write about it on our brand Facebook fan-pages and blogs. I’m waiting for your reply. Thank you in advance. Excellent work on this, Scott. I know this took tons of work, but I think the changes and organization of this latest version are a huge improvement. When it comes time to update this again, we’d love it if you considered including inPowered in the Content Marketing section. Here at inPowered, we offer a free tool for discovering all of the content that other experts have written about your brand, products or trends you’re interested in, then we enable you to amplify that Trusted Content to social channels (also free) or through the inPowered network. Amplifying through the inPowered network places that Trusted Content (credible third-party articles or reviews) as native ads across contextually relevant web, search, social and mobile environments. We then provide deep analytics regarding people’s interaction with the content you amplify (lift in reads, time spent, social shares, and how reading the content affects their consideration of your brand). It’s a great tool to help content marketers discover and curate Trusted Content about their brands or products, and to track the content’s effectiveness and influence. It also helps cost-effectively scale content marketing efforts by identifying existing content written about you that you can amplify, reducing the time/money needed to produce additional content. I’m happy to discuss or answer anybody’s questions here – simply comment and I’ll respond. Cheers! Scott.. I’ve been online for the past 20 years researching, educating, adventuring, producing and exploring the evolution of technology, science, marketing, behavior and all things alike. Your info graphics have been very useful in demonstrating how the world of marketing technology is evolving. Keep up the fantastic visualization(s)! I use to do my own, until you made them. The core fundamentals of directing and managing users inside these platforms are still a major challenge of large companies. Training resources to properly use each platform and its workflow capabilities can at times silo out other important area’s of the business that have just as a dramatic effect as the landscape itself. Being both specialized in a specific area, yet being a generalist so you don’t lose the big picture is essential in the growing concern of talented producing technologists. At the end of the day, it’s a big red ocean filled with competition and the same questions still need to be asked of people and the tech they build. Is it real? Can we win? Is it worth it? Also to that effect are the questions of; what is your unfair advantage? What problem is your technology solving? Is it just a tool in the toolbox or does it have significance inside an organizations strategic objectives. The landscape will continue to evolve and I hope so does your catalog of technology solution providers. Excellent work Scott! Thanks for taking the time to continue improving and categorizing the landscape outline. If you get a chance, can you ping me as we have an updated logo for you. We no longer use the @ symbol. Thanks! Per the previous comments, Scott, great job pulling this together. Anyone who’s ever worked with a slide full of logos knows this takes some consideration. Hi Scott, great visual and explanation behind it. Also, thank you in advance for adding TagCommander to your Supergraphic. Although tag management is our bread and butter, our platform also offers data, privacy and attribution management. 1. That the barrier to entry is now very low. 2. That their is increasing divergence, not convergence. 3. The technology curve is still in it’s infancy. 4. Consolidation of platforms shows maturity and it’s not here. My real fear is for the clients of these platforms, it appears to be a case of “divide and conquer”, land grab by tech platforms to the determent of the customer. The real issue is do the businesses understand the challenges and goals they are seeking to achieve by their marketing technology strategy. Because most don’t have a strategy. You see, most marketing is still formulated by building a plan of activity, which in no way reflects the way that consumers now are experiencing the brand communications. Brands of high value are recognizable because of their intimate connection and engagement with their consumers, this is why RedBull, GoPro, Under Armour and Nike are “brands” even though they make their revenue from selling a product. It’s because the brand has relevance and a connection, through a brand experience. So, please my advise to the CMO’s of the future is understand how you are going to build a “brand experience” and understand how you content drives the experience, excitement and engagement. The real issue is not controlling the output channels as these develop everyday, as digital is such a flexible and accessible technology framework (I can build an Appstore app in a day), it’s understanding the value, relationships, relevance and value of your content. If you think of content as your business, you would strike off 80% of these technologies, because semantic relationships around content are the value to the brand, not executing as much as you can find. The future, watch out for those “ERP brand content” technologies of the future, you think that business value is in your CRM and ERP, it’s not it’s in your “brand content” and how you leverage it, report it, analyze it and repeat it. That’s where the smart money is going, why do you think that GoPro think they can be a media channel? because they know more about their customers and what their customers do with their products than any other brand on the planet! Enjoyed your post and the supergraphic. Would love if you could include Ampush in your next update and ongoing coverage of the space. We’re a native ad technology platform that helps enterprises advertise at scale on Facebook, Twitter, etc. We’re a Facebook sPMD and can be found in the Native Advertising Lumascape under “In-Feed Advertising Platforms”. Happy to answer any questions or help out in any way going forward. Scott – great post and amazing Infographic. I’d like to make you aware of another solution that should be included under Social Media Marketing solutions. Decisyon/Engage is a Social CRM solution that is built on our collaborative BI and performance management platform. The solution is being used by large B2C companies in Europe like Telecom Italia to integrate customer information from social media channels with internal CRM data to gain a 360 degree view of customers and drive improved customer service and social media marketing campaigns. Here’s a link to our web site where you can find more information about the product and customer examples: http://www.decisyon.com/solution/customer. I just heard of your project via Robert Rose from his talk at Intelligent Content Conference. I think you are missing Listly from you chart. We’re like slideshare, but for lists. We make list social, collaborative and embeddable. Based on your categorization we span Marketing Apps, Content Marketing & Marketing Environment. I heard from Ian Cleary that he has 1200+ tools on his list. I’m very tempted to make this into a number of Lists on Listly that way its a lot more extensible and shareable. If it’s something you’d like to collaborate on I’d love to help. Great landscape! You should look into http://www.fliptop.com for predictive analytics / predictive lead scoring. What’s your take on this report: http://venturebeat.com/2014/02/26/top-10-marketing-automation-companies-the-vb-index-report/ ? Between your graphic, and that report, it’s becoming really clear this is a big industry. I think the VentureBeat report is great! Is is, indeed, a big industry. Thanks for the heads up on BlogMutt too! Scott, thank you for the new release this year. I oversee sales and marketing for a local technology platform provider and am spending my time in the field talking to CMO’s, CTO’s, CDO’s on how to navigate this ecosystem. This is so beneficial. We are working with some of the most prestigious brands within insurance, financial services, home services and others. Would be great to be considered as you continue to build out your landscape. We also integrate with 3rd party applications. Thank you! Scott – long standing follow-up from our email conversation… ball was in my court to drop a comment to remind you that OneSpot should be in the Content Marketing zone. Here it is… Thanks! 95% percent of Ad-Tech Companies will never reach $1 million in re-occurring revenue. Of the remaining 5% that do, 95% will never make it to $5 million. And of those that make it that far, 98% won’t get to $10 million. This is a great graphic. It shows just how many vendors there are out there and how vast marketing technology has become. One quick comment: In the Customer Experience / VoC category, don’t forget to add Leger Metrics (www.legermetrics.com). We are a growing player in the space. We provide VoC solutions to leading consumer and multi-location brands including major retailers, restaurants, grocery and convenience stores, financial institutions, and automotive. We provide a customer feedback management platform that allows brands to continuously gauge and report customer experiences across all touch points and channels. Scott, this supergraphic is quite an amazing capture of a large sample of the many different kinds of software available to marketers today! Thank you for taking the time to compile and provide structure around all of the myriad offerings. That said, I do have one more addition to the Backbone Platforms/E-commerce portion of the chart—InsiteCommerce. InsiteCommerce is an enterprise eCommerce platform with a strong focus on business-to-business. Thanks! Scott – This is incredibly thorough and very interesting. I look forward to seeing the next graphic, showing the continued growth of the marketing technology industry. I hope that in the updated image, you can include MassiveImpact, a leader in performance mobile advertising. Thank you for the insightful work, it has been a great education into the evolution of marketing. 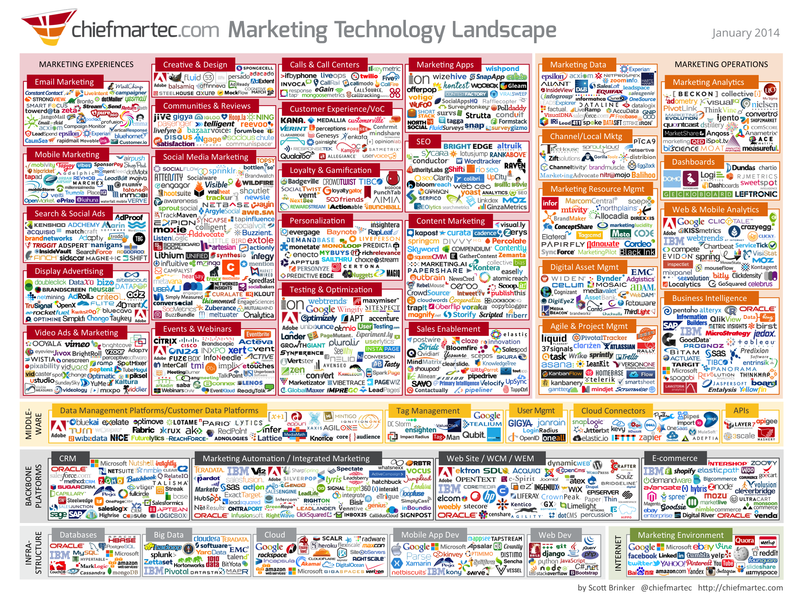 A really great overview of what’s up in the marketing technology landscape. Must have been hell of a work. I’d like to mention one more company to increase the 10% of search ad tech: camato (www.camato.co.uk). It’s a PPC technology with a really great semantic approach making PPC advertising via Google AdWords a lot easier and more successful. This is a great list of companies. However, you forget OSI Affiliate Software http://www.osiaffiliate.com we help companies to be able to easily setup and manage an affiliate / referral software and we work with thousands of companies. Keep up the great work! Hi Scott. I am presenting at a CMO CIO conference in Sydney Australia on 22nd May. I would love to use your Marketing Technology Landscape graphics as part of my presentation. The context in which I will use is based on the pace of change in Marketing Technology is staggering from 100 to over 900 players in just a few years. Given this it is critically important for Marketing & IT to align to ensure customer centricity sits as a key objective when navigating the technology landscape. Best regards. Jeffrey. This is a great work, a good concept for CIO & CMO, It seem to me the situation is IT department provide the “IT solution” but not “marketing solution”, and marketers often don’t know how to evaluate it by IT solution, I hope this map can help me to explain and integrate some misunderstanding between departments. Incredible work here. Very impressed. Many business leaders think digital marketing = CRM = salesforce.com. That this is 99% of the ecosystem. Thank you. Scott – follow-up from our email conversation. Leaving a comment to remind you that Fliptop should be in the Customer Data Platform category. What an amazing piece of work, Scott! I’m currently working on projects that have to deliver the right solutions in Marketing that will last the next 5 years. You work helped me make clear to the C-level, that there has been, and will be, major development in the field. Not only did the 2014 edition help me explain to them how the marketing field can be segmented, it also proved the point of ongoing solution development, when shown together with you earlier editions. Now all we have to do, is ‘just’ find the right solution(s). Where would Appnexus fall in this ecosystem? This is fantastic and an eye chart as well. Is there a way to search the vendors? I suspect you would have had companies saying that they should be in more than two boxes, but have you had any companies approach you to say that they are placed in the wrong box? Curious why you abandoned the paid, earned, owned structure? Do you see it blurring? Content marketing for example. Is it paid or earned? Scott, looking forward to meeting you in-person at MarTech Boston! For the next version of the graphic could you add Docurated (www.docurated.com) to the Sales Enablement category? We help the Sales organizations in companies such as DigitasLBi and Havas surface and leverage the best Marketing content for higher quality pitches and faster go-to-market. Scott, here’s one more for you: Selasdia is an attempt to develop a robotic BDR (business-development representative) and is a product of an AI research lab in Bangalore (Aiaioo Labs). Selasdia’s artificial intelligence allows it to build lists of prospects, interact with them (this still requires human oversight) on social media, and through the interactions, spread awareness and build an audience. Selasdia also facilitates sales through intention analysis. It looks for signals from prospects that indicate a need for the product being sold and homes in on opportunities for sales. Selasdia also opens up channels for communications and is intelligent enough to spot decision makers in firms. This product has been under development for 5 years and has been in the process of a phased roll-out over the past one year. Selasdia is usually operated by the B2B marketing teams who configure it to spot leads, and then respond to any suggestions from the robot. When Selasdia picks up leads, the marketing team usually vets the recommendation, and passes on the “marketing qualified leads” to the sales team. The volumes of “immediate needs” spotted by Selasdia vary from industry to industry. We have seen as many as 4 “I want to buy this …” messages a day come through the tool in verticals like software services. But there are many verticals where no needs are ever expressed on social media. The volumes of B2B prospects (decision-makers) that can be picked up by the robot in a day can vary from 100 (specialized product sales) to 10000 (in the legal domain). Adobe Dynamic Tag Manager or DTM should be added to the Tag Management Platforms. Scott, you missed the largest local search media and Advertising company in the United States on this list, YP. This is a really great resource for marketers. I have followed with interest as your “lumascape-like” map for Marketing Technology has taken shape over time. I’d like to see we can get Appboy on your map under Mobile Marketing. We do marketing automation for apps, and are getting a fairly extensive client list with Living Social, Hailo, USA Today sports, Urban Outfitters, Bauer Media, Pinger, TextPlus, Glide, and more. We are on the radar for the world’s best apps, let me know what you need to get us on yours! Hello, there! We noticed CouchDB on the list of Databases, but Couchbase was not listed. Could you update this? It was nice meeting you at the NYC MOCCA event a few months back and outstanding job at the first annual MarTech show. I’m looking forward to the show in the Spring and will probably see you at the NEDMA event. SALESmanago is a cloud based marketing automation platform used by over 1000 companies in 20 countries. According Datanyze, it is one of the world’s top 10 marketing automation platforms. Customers include Deloitte, Yves Rocher, Timberland, major banks, retailers and large eCommerce players, as well as hundreds of small to medium sized companies. Combined, SALESmanago customers use the system to manage over 50 million contacts. SALESmanago offers a complete suite of products for marketers including website visitor identification and tracking, e-mail marketing with personalized dynamic e-mails and product offers, dynamic website content, and personalization for ad networks and direct sales channels. solution for mobile apps, including: Content Management, Marketing Automation, flexible A/B Testing, and very powerful Analytics. Let me know if you’d like to see a demo as well – happy to schedule it. Hi Scott, Please add DevHub to the next version of the Infographic. DevHub is a private labelled online/mobile presence platform designed to easily integrate into our client’s marketing offerings. Used for single and multi-location websites and Landing pages. DevHub would sit in the WEbsite/WEM/WCM category. Hi Scott, You are on our wall (even the physical one)! You included VEMT (http://www.vemt.com) in the 2014 landscape in the category of loyalty and gamification (which we were honoured by). For your 2015 landscape, we would like you to consider us to classify us in ‘Integrated marketing cloud’, or whatever the category might evolve in in this year. Also an idea: is it an idea to make a ‘US’ landscape, European landscape, Asian landscape, etc? We definitely would like to help with that, so let me know! Hi Scott, quick follow up on my previous comment: Just saw your preview of the backbone platforms for the 2015 landscape. Sorry, missed that one before. In that light, we would position VEMT in the ‘platform/suite’ category. Let me know if you would need additonal info. And of course, let me know if we can support creating your epic work in any way! Hi Scott, Incredible work! Respectfully, I would like to draw your attention over our startup- MachinePulse (www.machinepulse.in). MachinePulse is a provider of rapidly scalable solutions addressing the machine data requirements of industrial protocols, M2M and IoT segments with real time big data analytics and decision science on a cloud platform. Our integrated platform provides breakthrough operational efficiency leading to quantifiable monetary benefits. We provide machine data solutions powered by erixis™, our intelligent cloud based, analytics platform.MachinePulse has launched Node X1, its universal Internet of Things gateway that connects machines, devices and sensors to the cloud. “NodeX1 embraces all legacy protocols and allows for connection to any sensors, devices on any network to any cloud platform and on top of that it is customizable according to customer requirements,” says Basant Jain, CEO of Mahindra EPC. MachinePulse has its seeds in Mahindra EPC, a Mahindra & Mahindra Group company. It would be great if we could fit into this frame.Thanks! Scott, this is EXTREMELY helpful in understanding the vast Marketing Technology landscape. PS Who should I contact about possibly being an Exhibitor at the MarTech conference? How is Qualtrics not on this?!? thx for the post, but I think you forget about Proofquick. It`s quite old, but cool service for online proofing. One of the links is broken (marketing technology LUMAscape). I really admire your work, though! Hi Scott, I am confused what to buy IBM Unica and Marketo. I checked on the internet and it seems that marketo seems to have more market share than IBM Unica. My friends are suggesting IBM Unica is good for B2C business and Marketo is good for B2B. My business is B2C. Would like to know which one would serve me best and if none then what alternatives do I have ?